What do you have to say about this great device because am short of words. Oukitel is always doing their great work in producing amazing devices with massive battery capacity. Last year, Oukitel launched a device called k10000 with a whooping battery capacity of 10,000mAh, although the device is coupled with metal body and has 2gb RAM. So it didn't impress people much. And many complained that it was heavy. K10000S. The device will feature most of the specs inwhich the previous released device has. The new device coming will also have the same battery capacity of the previous but they are making it to be more advanced in such that the device won't be heavy unlike the previous released. So the idea is to reduce the battery size, making it to be slim but will still retain the 10,000mah. 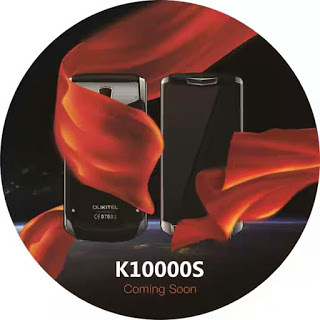 The went as far as replacing most part of the device that is metal with a leather or rubber material in the new K10000S. So as to reduce the weight in other words making the device to look more premium. As it stands, we don't have more knowledge about the specification but we are sure that the device is coming with 10,000mah and as a newer version to the predecessor, it is surely noted to come with higher specs much more than the previous. Also, talking of the price, we don't really know what the price will be at the moment. The smartphone is said to be launched at the Global Source Exhibition on the 18th of October, 2016. Well the date of release happens to be tomorrow, so let's be observing what Oukitel company has to present.